Hello, I was wondering if someone could answer a couple of questions for me. Vehicle is a 2010 SE with the 3.5L V6. The cold weather has come in and along with it came a check engine light. 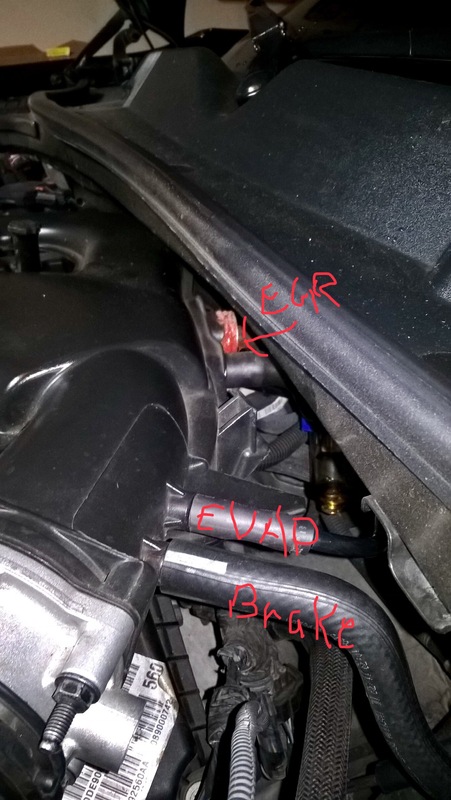 I pulled the codes and it is a P0455 - Evap System Leak. I opened the hood with the engine running and could immediately hear a vacuum leak. So, I start feeling around to see where it was coming from. It's on the hard pipe that runs from the rear of the intake manifold and down to the EGR valve. It's the connection at the intake manifold that is leaking. Looks like some sort of sealant has been used in the past. When I press the connection back in, the leak goes away, but it doesn't appear that it'll stay sealed without some intervention on my part. Here's a pic of the EGR tube that I found via google. 1) How does this pipe seal at the intake manifold? 2) Would I be better off replacing the tube? If so, does anyone have the part number? usually there's a gasket for EGR connections (hot exhaust temperatures) or a high temp sealant such as would be used on exhaust connections. All my past vehicles had a metal / composition gasket that sealed the EGR. You've identified the vacuum leak - addressing the seal area would probably take care of the issue. I did some poking around on the 'net - there's an o-ring and a gasket. Looks like the o-ring probably seals the pipe to intake connection. Last edited by Hal H; 10-17-2018 at 07:46 AM. Thanks Hal. I guess I should have searched it little more. Dealer has the seal for $15 or Autozone has a fel-pro version for less than $3. Fel-pro is good quality - so you have that option. That EGR tube is prone to vacuum leaks where it plugs into the back of the upper intake plenum, and it is nearly impossible to get it to seal completely once the plenum has been removed (like for spark plug service) and reinstalled. You can try another O-ring, but don’t get your hopes up. The best solution I found when I had my 3.5L was to coat that tube (where the O-ring normally sits) with some Hi-Temp RTV (red) and then jam it into the back of the plenum nice and snug. You will have to do that each time the tube is removed, but it shouldn’t be getting removed that often anyway. It sounds like someone already tried that on yours, but the fact that is leaking now would tell me that it’s since been pulled out and then plugged back in without cleaning and reapplication of more RTV. Also, that DTC you mentioned in the original post is likely going to remain after you fix the vacuum leak at the EGR tube/plenum connection. So you should be prepared to have more troubleshooting tasks still to perform for diagnosing the EVAP system problem. Personally, I would concentrate on fixing the cause of the CEL first, then worry about the vacuum leak. As it is, the vacuum leak is not bad enough to really adversely affect engine operation, but the EVAP issue is. As long as that CEL remains illuminated, the car’s computer will refuse to go into Closed Loop mode where it is constantly adjusting the air/fuel mixture to be as close to perfect as it can get. That means the engine will be getting a steady diet if air/fuel that is too rich, as long as the CEL is on, that is. The longer you allow that to continue, the more likely it is too negatively affect your engine in the future, e.g. fouled and restricted cats, etc. As @Nuke mentions - the evap system could be a matter of a connector or hose leak that throws that code - or a fuel cap that is worn, not sealing as effectively as it should. Not bad enough to trigger a fuel cap code (system not holding vacuum), but when the system runs the purge valve cycle and checks for leak down rate, it triggers a code. Usually a smoke test is done to visually identify any leaks at tubing, connectors etc. Another item is to verify the harness / connector and EVAP purge valve is operating correctly or there's no restrictions or liquid fuel that is obstructing the EVAP lines. Over-filling the tank can cause EVAP system issues - trying to cram in an additional pint of fuel when the dispenser keeps click off won't gain you any benefit. Thanks guys! I'll try the RTV fix and keep looking for the source of the leak causing the evap system code. Guess I was hoping for an easy fix. I'd recommend getting the new seal, and as added insurance, some RTV sealant as well. These cars are not known to have problems with the EVAP system that I know of. That doesn’t mean they can’t develop one, but it’s not a common issue for them. As such, there might be a sliver of hope this has an easy fix. It’s hard to see since I scribbled on top of it, but that EVAP line has larger piece of hose over it where it connects to the plenum. That is because the hose developed a crack and a leak, so I had to McGyver a fix one night, and that’s it. Anyway, my point is, follow that hose from the purge canister all the way to the plenum and make sure there are no cracks or other obvious spots for a leak. If you ind one, that will be an easy enough fix I’m sure.